SAIL Notification is out. SAIL is recruiting for 72 Mining Sirdar, Overman And Surveyorn Govt Job Posts. You can check SAIL - Steel Authority of India Limited last date, download SAIL notification, visit SAIL official website and check other SAIL Vacancy details.Complete Vacancy and recruitment Details about 72 Mining Sirdar, Overman And Surveyorn Govt Job vacancies in SAIL are provided below by JobSarkari.Com only for you. Last Date of Apply Online. 10/03/2019. Last Date of Payment Application Fee. 10/03/2019. Overman, S-3 Rs.250/- No Fee. Mining Sirdar, S-1 Rs.150/- No Fee. Surveyor, S-3 Rs.250/- No Fee. Overman, S-3 11 02 02 04 19. Mining Sirdar, S-1 27 07 07 11 52. Surveyor, S-3 01 00 00 00 01. Total No. of Post 39. 09. 09. 15. 72. Overman, S-3 Candidate Must Have Passed Class 10th with 03 Years Diploma in Mining Engineering with Minimum 50% Aggregate Marks (40% Aggregate marks for SC / ST / Departmental Candidates) with Overmanship Certificate of Competency from DGMS, Along with Valid Gas Testing & First Aid Certificate. Mining Sirdar, S-1 Candidate Must Have Passed Class 10th with valid Mining Sirdar’s Certificate of Competency from DGMS Under CMR (for Coal Mines), Along with Valid Gas Testing & First-Aid Certificate. Surveyor, S-3 Candidate Must Have Passed Class 10th and 03 Years Diploma in Mining & Mine’s Survey with Minimum 50% Aggregate Marks (40% Aggregate Marks for SC/ST/Departmental Candidates) with Surveyor’s Certificate of Competency. Height. 155 Cms. 143 Cms. Weight. 45 Kg. 35 Kg. 4. Candidate Need to Apply Online Before 10th March 2019. Q. What is the Last Date For SAIL Mining Sirdar, Overman And Surveyorn Govt Job Vacancy ? A. 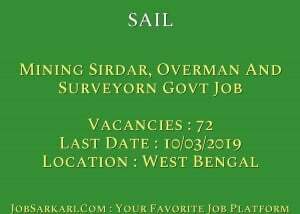 Last Date for SAIL Mining Sirdar, Overman And Surveyorn Govt Job Posts is 10/03/2019. Q. 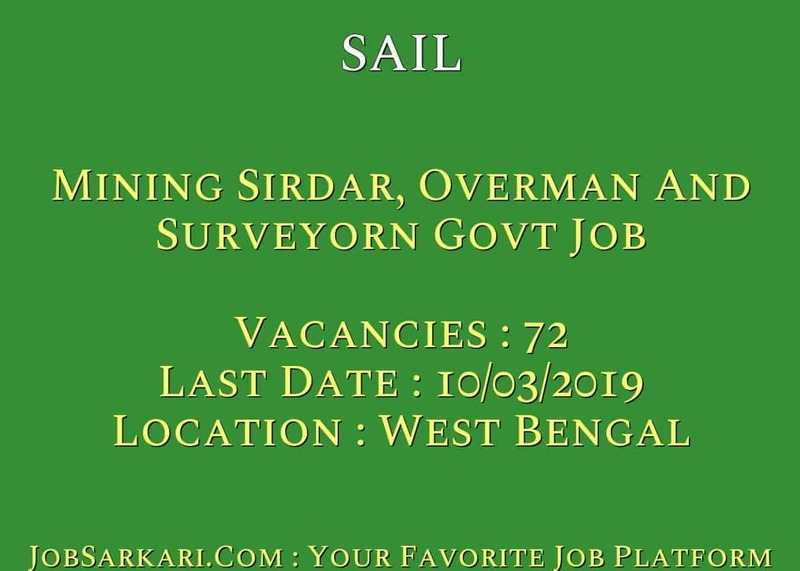 What is the Form Type of SAIL Mining Sirdar, Overman And Surveyorn Govt Job Recruitment ? A. The Form Type for SAIL Mining Sirdar, Overman And Surveyorn Govt Job Posts is Online. Q. How many vacancies are available in Steel Authority of India Limited Mining Sirdar, Overman And Surveyorn Govt Job Posts ? A. There are about 72 Vacancies in Steel Authority of India Limited Mining Sirdar, Overman And Surveyorn Govt Job Posts. Q. What is the Full Form of SAIL ? A. Full Form of SAIL is Steel Authority of India Limited .